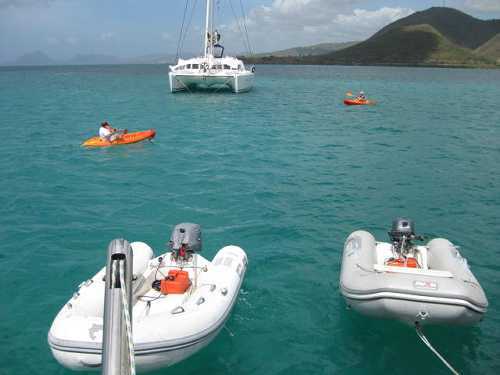 On Tuesday 2nd we had a beautiful 4 hour sail up to Martinique – our best sail yet – and anchored in Marin. We smelt coffee, and garlic, and our mouths watered. Martinique is the largest of the Windward Islands, and apart from a few short spells under the British, has been French since it was colonized. You feel it immediately… french cars buzzing along excellent tarmac roads, recycling bins on white pavements, it’s clean with a thriving economy. After checking in with customs and immigration (which was oh so easy compared to the other islands!) we dinghied up to the supermarket, grabbed a trolley, and stuffed it to the brim with canned duck, saucissons, nice cheeses, French wine and baguettes …. Heaven!!! We then wandered around the fantastic chandleries and found yet more parts we have been searching for in months …. More heaven, and a breath of civilisation after months of deserted beaches and raw nature! 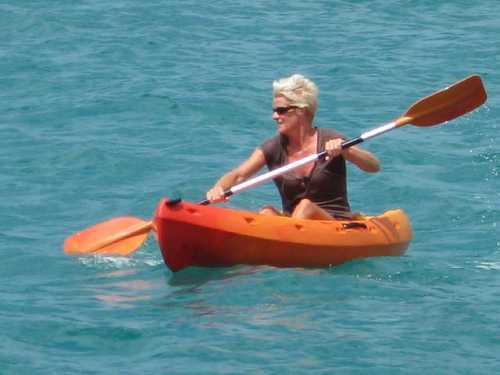 At last we have found the kayaks we have also been looking for since we arrived in the Caribbean, and at a reduced price … so we bit the bullet, and Talulah now has 2 bright orange ears, when they’re not in the water. It is so nice to play around the anchorage, and be able to paddle up to the beach without having to haul out our big heavy dingy and its 15 hp engine through the swell (weighing 120 kgs)… and its a good way to keep fit! After a couple of days in Marin we then anchored off Ste Anne nearby, a small and pretty seaside town, where we have been catching up and eating with friends anchored nearby. Andre on Panorama (with Eric) cooked us a fantastic fish fondue (he used to be a restaurant manager), and we had a night of wine-tasting with Welly and Keith on Rapau. Yesterday (Sunday) Welly, (who is a marine archaeologist) and Shane, went diving off a nearby reef, while I kept a look-out in the dinghy. It was great to get the dive gear out again and go down with someone so experienced. On Thursday 4th, as I was playing with the radio at anchor, I flicked it onto channel 16 briefly, and was stunned to hear a very familiar French voice trying to radio through to the marina. It was Flo !!! Our dear French friends, Michel and Florence, who we last saw, and cruised with, in the Canaries. 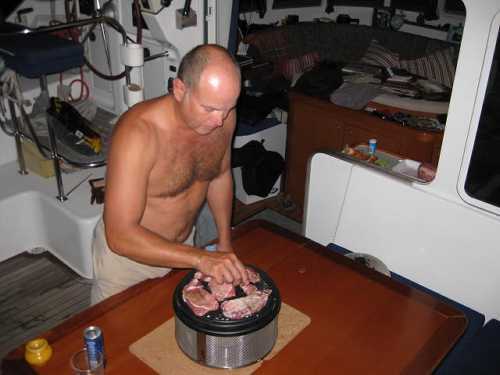 They were just arriving after an eighteen day sail from the Cape Verde Islands, and were very hungry and excited. We rushed over to them as they dropped anchor next to us, with a sack of our newly acquired saucissons, cheeses, baguettes and wine …. And celebrated their arrival and our reunion in typical French style. (When we left La Gomera for the Atlantic Crossing, they cast off our lines, and tearfully Florence and I exchanged necklaces as we said goodbye …. So it was so moving to be here and greet them as they arrived after their long and arduous journey). We have spent the last two evenings catching up with them in the little bistros in town, and snorkelling / diving together …. 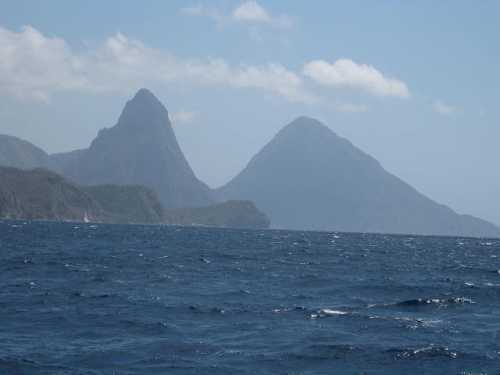 But sadly today we say adieu, as tonight, at midnight, Shane and I need to set sail for 2 nights up to Nevis ….. our longest sail yet in the Caribbean! Welcoming party in Rodney Bay, St Lucia. 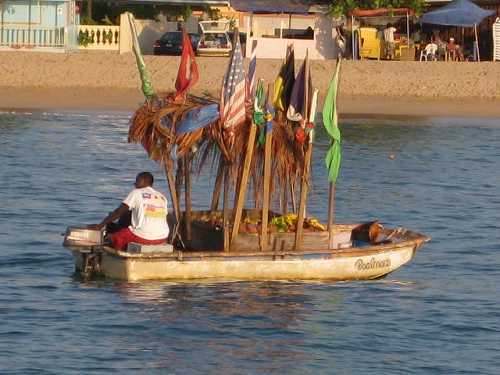 A fruit seller / boat boy and his pleasantly and originally decorated boat. Our service station, our workshop, our sweatshop and occasionally our bed. It’s not all plain sailing. 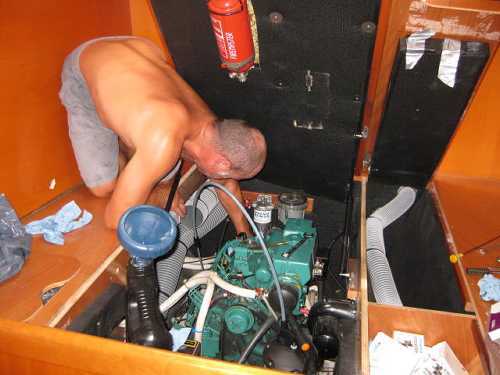 Very hard work, servicing one of the warmed up engines when it’s 38deg outside. Our new charcoal barbeque in action. A marvel of modern invention. Look, you can use it on top of the table without fear of a single spark flying out, and no heat being lost and burning the table. Magic! 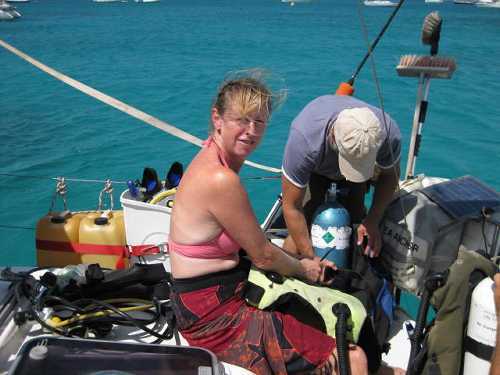 Shane and Welly (Rapau) get ready to go scuba diving. Michel and Florence (Flo) dry out after snorkelling on the reef. Our dear French friends we last saw in the Canary Islands. 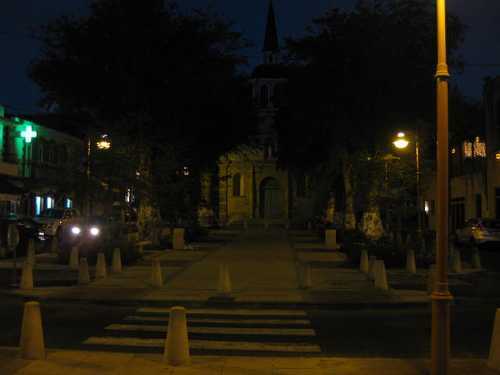 Street lights, pavements, churches and neatness. The very civilised world that is Martinique, is like a breath of fresh air after the rest of the Caribbean. Ste Anne. Arrived Falmouth, UK - Day 10 !!! Set-off for Atlantic Crossing today!! Day 23 - ARRIVED BARBADOS !!! Day 7 - A Fishermans Tale, a true story. Bay of Biscay crossing, Halfway to Vigo 29 hours in.